Free Fro Yo at Berryline in Fenway! One Kendall Square Music Lab- Tonight! Berryline is expanding beyond Cambridge. Today, from 3:30pm-9:00pm enjoy free fro yo at Berryline Fenway, located at 1377 Boylston St.
Head over to Great Scott in Allston tomorrow at 3:00pm for a chili takedown. So for $10 you can try all the chilies at the event and for free you can enter your chili for a grand prize of $100 for people's favorite or $50 for judge's fave. Worth a trip down to Allston! Click here for all the details. New ways to get in touch with us -via Google Voice! All of us at Boston On The Go would love to hear from you folks! You might notice that we have added a new feature on the right hand side bar, "please leave us a voice mail!". By using this widget, you can leave us a voice mail! Give us some feedback and/or any type of event/place news that you think is worth putting on our blog. Hope to hear from you soon. To read more about how to leave us a voice mail using the Google Voice widget on the right side bar, please click on the below link. 1. Click on the Google Voice icon ("Call Me" icon) on the right side bar under "Please leave us a voice mail!" 5. Answer the phone. It will be ringing for a bit then it will go to Boston On The Go's voice mail. Follow the instructions to leave a voice mail for us! If you leave us a voice mail regarding a specific events and/or place, we will try to post them on the blog! You've already been working for the weekend, so go out tonight and enjoy the City of Cambridge's annual dance party tonight. Tonight, from 7:00p.m. – 11:00p.m. in Central Square near City Hall, join hundreds of people for a free, citywide dance party (with DJs!). And remember, if you don't want to shake what your momma gave ya, remember that Mass Ave will be closed down for the event. During your lunch break tomorrow or before you meet a friend for an after work drink, check out the month long event "Art Fridays" on Summer Street in Downtown Crossing. Local artists will be selling paintings, photography, jewelery ans more. Art Fridays runs Fridays in June from 11:00am-7:00pm. Click here for more info. So the Greek Corner II is out, and Falafel Corner is in. Brattle Theater is asking you to enter into the annual Trailer Smackdown competition. The Brattle Theatre announces an exciting addition to its annual celebration of movie marketing and backyard fun, TRAILER TREATS. The TRAILER SMACKDOWN is a homemade trailer contest where filmmakers will compete to make the most compelling trailer for an as-yet-unmade film entitled simply "Union Street". Each filmmaker (or filmmaking team) will be required to incorporate certain elements (genre, location, character type, action, etc) in their two minute or less trailer. All entries are due by July 6, 2009 and must include a Registration Form. A dedicated group of filmlovers will gather for a preliminary judging round and the finalists will be screened during TRAILER TREATS on July 16, 2009. A Grand Prize Audience Award will be voted on and a winner announced at the event. A cash prize will be awarded and the winning trailer will be featured on the Brattle's website as well as screened prior to certain features during our July/August calendar. A $10 entry fee is required with registration for the competition. Click here for full contest rules and registration! Looking to take advantage of that $8,000 first time home buyers tax credit? Then check out tonight's American Brewery Lofts Open House in JP tonight. From 5:00pm-8:00pm enjoy food, music and raffle prizes and I would hope a tour of the units, too. Click here for more info. Back by popular demand, the ICA is hosting "Talking Tastes," as series of talks with popular Boston and New England chefs. The chefs will discuss food and drink, talking about their latest flavors and signing copies of their cookbooks while you sample their tempting recipes. My pick? Ana Sortun, owner of Cambridge's Oleana and Sofra. She will be talking on Friday, June 26th at 6:30p.m. The talks are free with museum admission. Space is limited. Free tickets available on a first-come, first-served basis at the admissions desk one hour before the program. For more info, click here. Ready to get your groove on? Well, Dancing on the Charles is starting this weekend. From 7:00pm-1:00pm on Gerry's Landing you can enjoy DJs & more. Cover is $10 before 9:00pm, $20 after. You know summer has kicked into gear when the Hatch Shell movies have been posted. Starting this Friday, starting at sunset (approx. 8:00pm) enjoy free movies down at the Hatchshell. Click here for the full calendar. My pick: go see Iron Man in August...if not for Robert Downey, Jr. then just to get in gear for Iron Man 2 next year. Enjoy! Head over to Kendall Square tonight for the first ever One Kendall Square Music Lab! “The One Kendall Square Music Lab”, is a series that will take place on Wednesdays June 17, July 15, and August 19 from 5:30-8:30pm. Prominent local bands The Evan Goodrow Band (6/17), 3rd Left (7/15), and Audio Underground (8/19) are scheduled to perform two-one hour sets at the festival-style events, which will also showcase the menus of The Blue Room, Cambridge Brewing Company, BeanTowne Coffee House, Flat Top Johnny’s, Tommy Doyle’s Irish Pub & Restaurant, and the recently-opened The Friendly Toast. Each restaurant will offer sampler versions of some of their most popular dishes for $5 or less, with a portion of the proceeds going to a local charity, the Kendall Community Group. Rain Dates: Thursdays June 18, July 16 and August 20. Click here for more info. Good news: free music starts over at the Boston Harbor Hotel this week. Bad news: it's a bit balmy outside, no? Anyways, the Boston Harbor Hotel is ready to give you free, outdoor music and movies all summer long. Enjoy jazz, film classics and more all week long. Music events are on Tuesdays and Movies are on Friday nights. Click here for the PDF calendar. We all know Berklee is filled with great musicians. And an inexpensive way to hear some great artists is through the school's Cafe 939. Click here for the full calendar and info, but may I recommend this week's The New Thelonious Monk Institute Sextet (June 17th, $10) and Ari Heist (June 19th, $15). Enjoy! Need something to do this weekend? Stop by the South End haunt ChocoLee for a Mouss-icle. According to the Improper Bostonian, for $3 you can get a Mouss-icle - chocolate mousse dipped in milk and dark chocolate. Delicioso. ChocoLee is located at 83 Pembroke Street. Need a temporary color change? Well the new Back Bay store Glam can help you out. The new spot makes custom hair units from 100 percent natural hair and also makes clip-on hair extensions so you can really look like Brit Brit at Halloween. Glam works with any ethnicity and works with people who have lost their hair or are just looking for a change. The store adds a funky decor and sells jewelry and tiaras, too. "Hair" just won a Tony, so maybe they are on to something. Glam is located at 33 Gloucester Street. The home of Green Tomato II on Elm Street near Davis has closed. Someone should look into making it a bar. Apparently nothing else works there. It's about time that Danvers isn't the only place to grab Cole Hann shoes at a steal. Boston.com reported today that the Shopper's World Complex in Framingham will have a Nordstrom Rack by Spring 2010. Woohoo. I heart bargains. Boston gal loves getting her green on. And these events are sure to do the trick. Check out Saturday's Fair Trade Fest at the Artists for Humanity Center in South Boston and Tuesday's first ever Boston EcoTweetUp. Fair Trade Fest is from 12:00pm-6:00pm at the Arts for Humanity Epicenter (take the Red Line to Broadway) and will feature food, fashion and more. Click here for details. And the Boston EcoTweet up? Well, BostonEco Tweetup is a free social networking event for anyone who is passionate about eco-living and trying locaal eateries. Yum. This first one is in the Fort Point Channel at The Achilles Project/Persephone, 283 Summer Street. Take the Red line to South Station. The events start at 6:00pm. Click here for more. The Wedding Singer anyone? You can catch it tonight and a variety of other movies this summer at the Pru on Thursdays. Entertainment (dining, pre-movie activities start at 6:00pm and the movies start at sundown. There is also a parking special: enter the garage after 5:00 p.m. and get $12 parking with retail validation ($10 purchase required to receive validation). As many of my fellow foodies have heard, a new spot will be across from Ivy Restaurant soon on Temple Place - Stoddard's Fine Food & Ale. Set to open late June, early July, the new restaurant by the folks who brought us Ivy will be replacing the old Stoddard's store. The restaurant is rumored to have 30 beers on tap and a shoeshine station. Old Boys' Club indeed. Boston has its first Senegalese restaurant, Teranga. Teranga translates into 'hospitality," and based on yelp reviews (I haven't been yet, sorry!) it looks like it's a comfort food hot spot. Prices are reasonable with entrees around $16, and the wine list looks interesting with South African wine and beer from Haiti and New Zealand. Teranga is located at 1746 Washington Street(between Springfield St & Massachusetts Ave) in the South End (T: Orange Line Mass Ave, Silver Line or Bus 1.) For hours & reservations: (617) 266-0003. Friends over at Sel de la Terre mentioned their Happy Hour deals on Twitter. Cheap oysters and cocktails? What's not to love? Tonight, from 5:00pm-7:00pm$5 cocktails, $1 Oysters, $1 Charcuterie plates. Sel de la Terre is located at 774 Bolyston Street, in the new Mandarin Hotel. DePasquale’s Homemade Pasta Shoppe opened at 66A Cross Street in the North End this week. The store offers over 50 varieties of pasta alone! Some of the different types of pasta include twenty flavors of handmade ravioli with fillings such as artichoke and lobster. Yum. The shop will also carry an array of olive oils, pestos, cheeses and fresh-baked bread. You can even pick up recipe cards, too. Some Mike's Pastry and a bottle of wine, and you got yourself a nice night. DePasquale’s Homemade Pasta Shoppe is open from Mon-Thurs from 10am-8pm, Fri- 10am-10pm, Saturday 9am-9pm and Sunday 10am-6pm. So we headed to Davis Square tonight to see Anvil! Story of Anvil! (which by the way, is highly recommended) and we stopped by the newest restaurant spot in Davis - the Boston Burger Co.
Boston Burger Co. is located at 37 Davis Square. Head over to Beacon Hill tonight for their Summer Stroll Event featuring promos, refreshments and a raffle at participating stores. Tonight from 5pm to 8pm more than twenty participating businesses in Beacon Hill are participating Summer Shopping Stroll. Activities include promos, refreshments and a chance to win a gift basket with a selection of products and services from all participating businesses. The more businesses you visit, the greater your odds of winning(one entry per business). Click here for more info. So this weekend, both Friday & Saturday, Harpoon is hosting its 2nd Annual Summer Session. The Brewery will feature Harpoon summer ales, like IPA, UFO and more. In addition to beer, enjoy live acts, DJs and BBQ from Andy Husbands of Tremont 647 and snack from Sister Sorel. Admission is $20. Fun starts at 5:30pm on Friday (June 5) and 3:00pm (June 6). Click here for more. The Federal, located on Cambridge St in Beacon Hill, is now open. While we haven't had a chance to eat there yet, we did swing by and pick up a menu (see below). 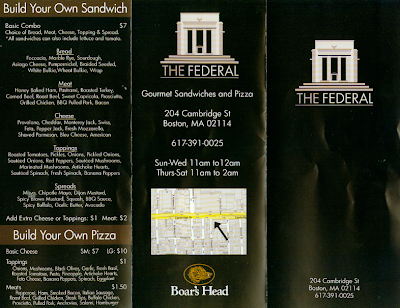 The Federal is at 204 Cambridge St (the former Venice Cafe location) and bills itself as 'Gourmet Sandwiches and Pizza'. 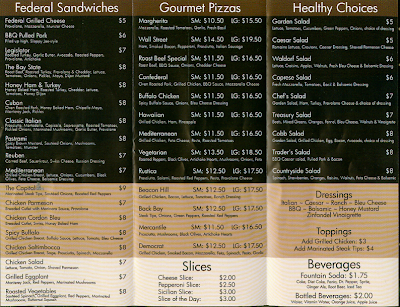 From looking at their menu their sandwich options do look quite tasty (with Boar's Head meat). While the hours (Sun-Wed 11am to 12am; Thu-Sat 11am to 2am) are not quite as conducive to the post drinking crowd as Venice Cafe's old hours, it is great to have another dining option added to the Beacon Hill mix (other late late night options currently include: Shangri La, Felcaro's Pizzeria, and 7-11). The sushi options downtown just increased by one with the opening of Exotic Sushi and Tapas. Signs for this restaurant covered windows at the downtown location and at a location next to the Lowes Boston Common theater for many months. Exotic Sushi and Tapas is located at 184 High St and just recently opened (so the usual disclaimers about trying a new restaurant in its first couple of weeks still apply here). I have not had a chance to walk by the Boston Common location to see if that one has opened. If anyone has information about that location, please let us know through comments! J's Tomodachi Sushi, a new sushi place on Mass Ave in Boston is open. The sushi place is located at 201 Massachusetts Ave, (between Clearway St & Norway St) near the Symphony T stop. Try saying that name twice.